This medicine should be used with caution during pregnancy, and only if the expected benefit to the mother is greater than the possible risk to the foetus. Seek medical advice from your doctor. The use of this medicine during breastfeeding is not recommended. Seek medical advice from your doctor. 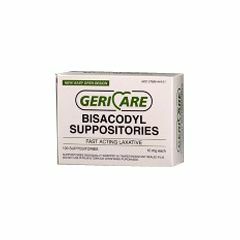 How can Bisocodyl Suppositories affect other medicines? There are no significant interactions reported with this medicine. When taken together with diuretics or steroids there may be an increased risk of electrolyte imbalance. This will only arise if excessive doses of bisacodyl are taken. This product takes at least 60 minutes to work and then you leak a gel-type oil the rest of the day. Yuk! Comparably No Match for Magic Bullets! These and all wax or oil based suppositories are insignificant when compared to Magic Bullet Suppositories. Magic's work in literally minutes as compared to other csuppositories that average 40-60 minutes to just begin to work! We use every other day and works great so there is no other complications. I need to use this product every 3 days. Easy To Install. Functional. Safe. These work the same as the more expensive suppositories. Is the suppository water based or oil based? Hydrogenated vegetable oil. That's the only thing listed on box. Bisocodyl Sodium, I believe. A mild stimulant. This is the same as in "Magic Bullet" but far cheaper. I use a suppository most days, but alternate between stimulant and non-stimulant (glycerin) suppositories.